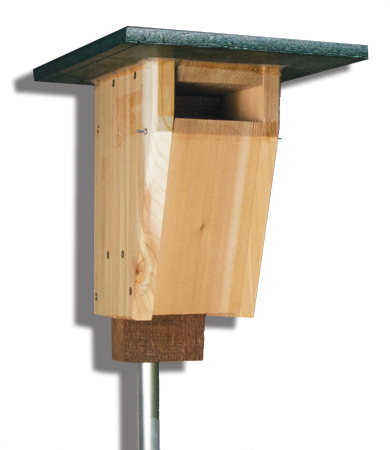 The sparrow-resistant bluebird house for sparrow infested areas, also includes aluminum mounting pole, and bluebird pole guard! Made from Western Red Cedar for light weight and durability. Roof is made from Poly-Tuff™ for greater exterior quality. Includes hanging bolt with nut and wooden nest tray. Includes a 3/4-inch x 78-inch aluminum post with drilled hanging pole. Includes Bluebird Pole Guard 4-inch x 30-inch PVC guard.